John of Salisbury (c.1115-1180) was an exceptionally well-educated and well-connected historian and philosopher, who knew King Henry II, Thomas Becket, and Pope Adrian IV intimately. He dedicated his most important writings to Becket, and witnessed his martyrdom in 1170. The present manuscript of his collected works was written at the abbey of St. Albans. The initial 'I' which starts the main text is, as usual, much larger and more elaborate than all the others. The palette is very limited, but the use of white highlights and punched dots in the gold create a dazzling effect. 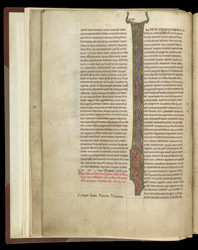 The rubric near the bottom of the left column records that the manuscript was commissioned by Simon, abbot of St. Albans (1167-1183), which allows the book to be dated with precision.